Russian environmentalists have been fighting to keep the world’s first floating nuclear power plant (FNPP) off the seas, citing catastrophic emergencies and possible terrorist attacks aboard such vessels of a scale that could rival Fukushima and Chernobyl. Recently, they got what seemed to be a reprieve with the help of an all too common Russian bank meltdown and the ensuing ripple effects. A court has impounded the floating nuclear power plant, under construction at the Baltiisky Zavod in St. Petersburg, following the collapse of the International Industrial Bank, which owns a majority share in that shipyard. But construction of the environmentally dangerous and security compromising floating plant – dubbed the Academician Lomonosov (Project 20870) – apparently continues. “Work is continuing as normal, and I think it should be commissioned on schedule by 2012,” a spokesman of Rosatom, the Russian State Nuclear Corporation, told Bellona by telephone Wednesday. 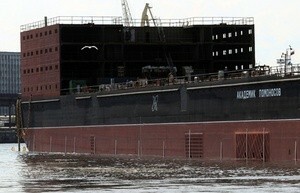 Baltiisky Zavod is scheduled to finish the plant in 2012, according to the contract. The 70-megawatt plant is then expected to be towed to the extremely tsunami-prone area of Kamchatka Region in the Russian Far East. In late July, a St. Petersburg court seized the newbuilding at Baltiisky Zavod after Rosenergoatom – Rosatom’s nuclear power plant operating wing that commissioned it – demanded recognition of its right of ownership to the unfinished vessel. Rosatom is reportedly worried that the floating nuclear power plant might be counted as one of the ailing shipyard’s assets when Baltiisky Zavod undergoes bankruptcy proceedings – something that Rosatom considers a likely prospect – and is hedging its bets. The July 26th court order, reported by Russian business daily Kommersant last Thursday, gave the go-ahead for the seizure on the basis of “significant risk” that Rosenergoatom could lose its investment in the 9.8 billion rubles ($334 million) vessel if another claimant seized Baltiisky Zavod’s assets during liquidation. Kommersant, citing the documents of the lawsuit, reported that Baltiisky Zavod has in fact registered its right of ownership to the vessel. Baltiisky Zavod’s general director, Andrei Fomichev, told the paper that the seizure had come as “a surprise” and that the company would challenge it in court. Fomichev told Kommersant it is customary in commercial shipbuilding for a yard to register a vessel under construction as its own property until the ordering party takes delivery of the finished newbuilding. An industry source also told the paper that in such cases the shipbuilder also takes out insurance on the vessel. The shipyard, which is 88.3 percent owned by former Tuva governor Sergei Pugachyov’s United Industrial Corporation, is facing litigation from numerous vexed creditors, said the Russian news wire Interfax. Claimants include insurance firm Sogaz, which is demanding a 51.1 million rubles in missed premium payments for the insurance on the floating plant, Khanty-Mansiisky Bank, which is seeking 128.75 million rubles, and an unnamed local Gazprom subsidiary, which wants 36 million rubles, Interfax reported. International Industrial Bank, known under the Russian moniker of Mezhprombank, had its operating license revoked when it declared itself bankrupt in November. And according to Kommersant, United Industrial Corporation’s stake in Baltiisky Zavod has been pledged to the Central Bank since last fall as collateral for an unreturned loan to Pugachev’s International Industrial Bank. Kommersant reported that credit to be in the amount of 32 million roubles. In January prosecutors also launched a criminal case against International Industrial Bank for intentional bankruptcy, the Moscow Times reported. Prosecutors claimed at that time that the bank had intentionally run out its assets to make its bankruptcy claim. The bank also declared its own insolvency, which is not recognized under Russian bankruptcy statutes: Сourt-appointed auditors must determine that a business is unable to meet the demands of its creditors. But Rosatom, understandably, is concerned over the fate of its brainchild, hostage as it is to the morass that sank Baltiisky Zavod’s majority holder. Last fall, the advance payments that Baltiisky Zavod received from Rosatom toward the ongoing construction got trapped in Mezhprombank’s accounts, which were frozen when the bank’s license was revoked, Kommersant reports. As of last October, that amounted to 1.7 billion roubles out of the total 5.7 billion roubles that Rosatom had paid Baltiisky Zavod by that point (or 66 percent of the contract’s value), Kommersant said. According to Leonid Andreev, an expert on nuclear economics who collaborated on Bellona’s 2011 report “Floating Nuclear Power Plants,” the issue of the advance payments that has triggered the court’s seizure order is “quite painful for Rosatom,” which devised the FNPP as a “demonstration project” – a pilot model showcasing the Russian nuclear industry’s capabilities in engineering and operating such sites. “The problems with Baltiisky Zavod is bad publicity for both the FNPPs as such and any sophisticated industrial projects in today’s Russia in general,” Andreev told Bellona. He pointed out that the main criticism of floating nuclear power plants has always been the steep price of electricity they would produce. Since the project was first envisioned, its total costs soared from 5.5 billion to 16.5 billion roubles, making it “unprofitable for any conceivable purpose,” Andreev said. The uncertainty surrounding the 1.7 billion in advance payments will drive the project’s costs even higher, according to Andreev, not to mention the financial losses caused by the disrupted construction schedule. Will the Lomonosov be contracted elsewhere? Incidentally, this most recent debacle is not the first to have hit Rosatom’s plans to build a generation of floating nuclear power stations to serve remote coastal communities in Russia’s north and Far East. Rosatom originally commissioned Sevmash shipyard, in the far northern town of Severodvinsk, in 2006 to build the first floating nuclear plant. Rosatom envisioned to build at least seven in a series of FNPPs in order, by Rosatom’s head Sergei Kiriyenko’s own admission, to even make the project commercially justifiable. But in 2008, the nuclear corporation, citing lagging schedules and alleged diverting of funding to an overload of military contracts at Sevmash, ripped up that agreement and re-awarded the FNPP contract to Baltiisky Zavod. Given the Rosenergoatom seizure of the Academician Lomonosov and the impending debt meat-grinder Baltiisky Zavod could face thanks to its associations with Pugachev, the contract, an unidentified source told Interfax on Thursday, might be assigned to another shipbuilder. Another Rosatom spokesman reached by telephone Wednesday declined to comment on whether another contractor would be appointed. Arrest a sigh of relief? Bellona and other environmental organizations have long been opposed to floating nuclear power plants, a controversial project that has become one of the most costly and extravagant nuclear baubles in Rosatom’s history. The dangers that are inherently present in land-based plants – as witness Fukushima and Chernobyl – are all the greater once a reactor is put on a boat and hauled to distant regions, environmentalists say. Additionally, the scarcity of safety infrastructure in remote areas will hamper any mitigation efforts should an accident happen. The vessels themselves, unprotected as they are with the same fortifications of land-based nuclear power plants, may also be attractive targets for terrorists seeking to obtain uranium and other radioactive materials. Added to these are the usual hazards associated with operating a marine vessel, all the worse in Kamchatka’s rough waters and weather conditions. It also remains unclear whether Rosatom has any customers ready to buy the FNPPs when – or if – the project goes commercial. For the time being, the nuclear corporation is eyeing customer countries in regions known to lack the political stability needed to ensure the security of such a site, such as Africa and Southeast Asia. Slivyak said the prevailing mood in the Russian nuclear industry toward the floating nuclear power project was that of broad scepticism, with some doubting that the vessel will even see the light of day over the next five years at best.